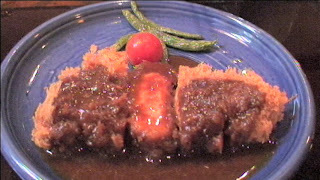 When I ate at Katsugen 4 years ago, it was after I'd been told my old favourite Tonkatsu restaurant Tonki was no more, and this was the new capitol of pork worship. I was so impressed with my first visit, I came back again, during brief time in Tokyo then. This was my first visit on this trip. Just as good as I recall. Menu is so funny (assuming you know English) that whatever calamities have befallen you before coming to the Marunouchi Bldg to devour it's sublime pork, will vanish away in hilarity and amazing meat. You read, between guffaws, of the arduous selection process of their pork, and their home made bread crumbs. I can imagine the owners of the restaurant sewing the wheat, raising it, milling it into flour, baking bread and then making the bread crumbs to encrust this finely appreciated piece of pig meat. I was instructed to try its two kinds of salt, but micro-experiment proved enough; save the salt for bad food. This is not that. The miso soup wasn't as good as I recall from 4 years ago and maybe they should hire someone to convert their menu into a known language but for good tonkatsu, you'll want to check this out. Identifying your supplier, or even being your supplier, these were marketing tools that could have a good effect. If you know brand X is good, maybe we'll notice when it isn't. I noticed when a local cidre maker changed its taste but kept its name. Did no one notice when Denny's went from Great Food to anti-food? Next, Eichi and Tomomi met me at Tonki, still in Meguro but in a different location. After a long wait, the pork was very good. 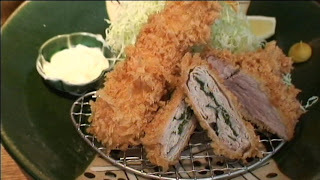 But not as good as the tonkatsu I'd just had two days before at Katsugen. No photos were taken. 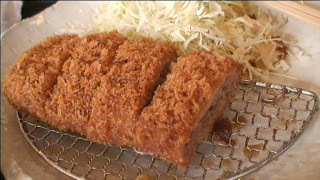 If you like tonkatsu, you won't be disappointed here, but my memories of standout egg batter based bread crumb empire are as long gone as the Austro-Hungarian Empire of my grandparent's day. Hamamatsu bar acquaintances told me to order the Ebi Fry, big fried shirmp in Nagoya and my Nagoya-esque friend Manny did but I went for the Miso Katsu on his wife Mineko's advice. A pleasant diversion from the usual tonkatsu and apple-based sauce. Eichi had been recommending this place Maisen in "trendy" Omotesando and I finally went there my last full day in Tokyo. It was as if I'd never eaten tonkatsu before. Like that first teppanyaki encounter. Admiral Perry invades my tongue. I didnt know tonkatsu could taste that good. The sauce in the biggest jar was the best. Was that grated daikon in it? No, that wouldn't keep long. Something chunkified the sauce like sudden bombs of pleasure blowing your enjoyment of the tonkatsu into some other level. This must be what only the Emperor got to eat not so long ago. I've had a lot of good food, and spent a lot of energy in search of it, but eating the top grade of hirekatsu at this restaurant (show up before noon to avoid the rush) is why you're alive. There may be pleasures greater than this food, but the difficulties you'd have finding them make a Maisen meal about as good as is available, in this known universe. I lived in Japan for 5 years and have spent much more than that in and out of Tokyo, Osaka, etc on business and holiday. 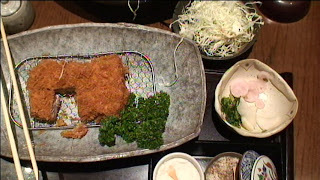 The old Tonki was indeed a special place, but Maisen absolutely, hands-down beats every other tonkatsu I've ever had. Unfortunately I haven't been to Japan in a few years but it good to know the place still is as good as ever. 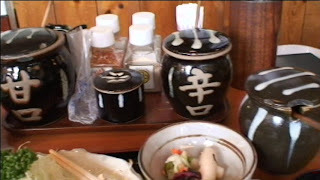 I visited Japan two weeks ago, and had lunch at MAISEN. 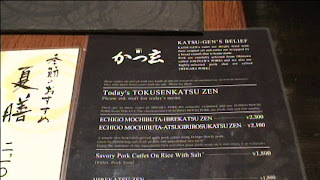 Not only the best tonkatsu I've ever tried, but also the tastiest and most tender piece of pork I've had in my life. Dinner at Diva: The. Best. Food. Ever!